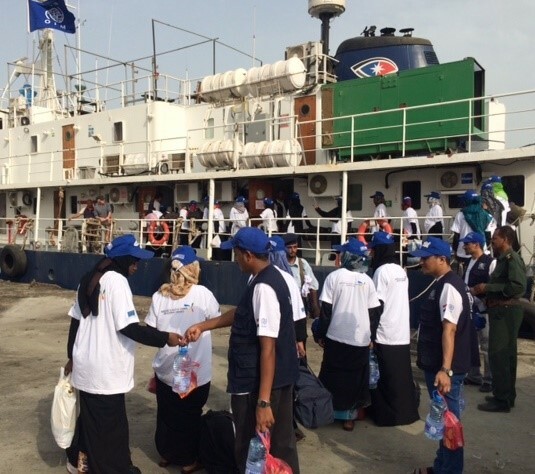 Yemen - IOM evacuation operations out of Yemen resumed this week (13 July) with the voluntary return of 150 Ethiopian vulnerable migrants from Hodeidah, western Yemen, back to Ethiopia via Obock port, Djibouti. The migrants were welcomed in Obock by an IOM team and officials from the Ethiopian Embassy, who provided temporary travel documents to enable them to enter Ethiopia. IOM Djibouti arranged their transportation to the Ethiopian borders where the IOM Ethiopia team provided onwards transportation to their final destinations. All unaccompanied minors received special assistance, including family tracing, organized jointly by IOM and UNICEF. In response to a noticeable increase in smugglers preying on desperate migrants, IOM Yemen had created safe havens where migrants could receive care, shelter and counselling within the IOM Migrant Resource Centre. IOM started operating in Yemen in 1994 when the organization assisted in evacuating migrants from Aden stranded during the civil war. The government of Yemen has been a Member State of IOM since 1999 and a first status agreement with the government was signed in 2001. IOM has worked closely with the Ministry of Expatriate Affairs on Yemeni migrant communities abroad and/or returning to Yemen. In addition, IOM Yemen has been providing transportation assistance to migrants stranded in Yemen and victims of trafficking in conjunction with the Yemeni Immigration authorities. Since the beginning of 2016, IOM Yemen has been providing emergency voluntary returns, in close cooperation and coordination with the relevant governments and IOM missions in Djibouti, Ethiopia, Somalia and other countries. The majority of the assisted cases have been Ethiopian nationals in addition to migrants from Niger, Nigeria and Sudan. The approximate number of migrants provided Assisted Voluntary return on 2016 to date is about 1,400. The operations had been halted for few months because of budget and other logistics constraints out of IOM control but resumed with this latest movement this week. The evacuations will continue throughout 2016 and with IOM Yemen aiming to assist more than 2,000 migrants to return home safely.